So many thrills from the morning inspection that I'd go and lie down if I didn't have an appointment at the fracture clinic at 10. I've fractured a metatarsal in my foot and I didn't even get to have a three-in-a-bed romp or launch my own scent (that won't make any sense to anyone who isn't British or an avid football (soccer) fan). Makes clambering out the window to check on my babies a bit tricky but it's ok as long as I remember to land on the right (ie left) foot. A single shoot has poked its head above the vermiculite in the Iris sibirica hybrids pot, there's similar action going on with Delphinium zalil, a rare yellow species from Afghanistan, and I've now got seven seedlings in the mixed Lily hybrids pot. 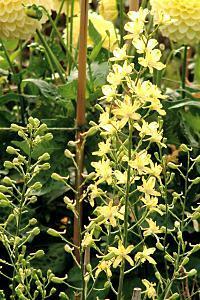 I have more Verbascum phoenicum mixed hybrids than I can possibly accommodate so get your orders in now! I'm promised spikes ranging from the deepest purple through shades of pink to white with pink eyes. Delphinium zalil, more of a curiosity than a stunner, and presumably a gift to the hybridizers! I'm also faced with how to make sure any of this is alive when I get back from holiday. I've sat the candelabra primulas in shallowish dishes of water so they will be constantly sodden but this should be okay because I had them seeding themselves in the mud between rocks right at the poolside at my childhood garden in Scotland. The other seed trays have been placed on capillary matting where available and covered with clear plastic lids (weighed down, natch). Hopefully the condensation and humidity will be enough to keep them moist but not encourage pathogens cos I'm rubbish on them and they're the questions I always get at work. Someone will bring in a leaf with a brown bit on it and ask what's wrong. If it's a houseplant I always blame the central heating, if it's outside I find the wind a useful partner in bluffery. Fact is, it's always some rust or something and the best thing you can do is spray it with something you wouldn't want to drink. Pots yet to germinate have been watered, covered in clingfilm (top tip, put something under one side of the pot so it's sitting at an angle or you get a build up of water on the film when it rains which causes it to dip in the middle and squish any emerging gems, a bit like on the awning outside a brasserie, which the French waiter will leave until an English looking couple walk past, at which point he'll decide to poke the awning with a stick, further drenching Doris and Derek. Can't decide whether to use the primula trick with Canna indica, which certainly wouldn't mind the soaking but a sudden cold snap and I'll return to a pot of slimy, dead mush. So I think I'll just give it a really good soak (the compost has a ridiculously high proportion of those moisture retaining granules that turn into blobs of jelly on contact with water) and zip it safely in the "greenhouse". Everything else is going to have to take its chances: the arilbreds and junos are under cover, the Frits are right up against the wall where the rain barely figures, and the other bulbs would normally be in the open ground anyway. In fact, the Dutch/English/Spanish (xiphium basically) hybrid "Eye of the Tiger", which are in a wide bowl oversown with Antirrhinum "Peaches and Cream" (already germinating by the hundred) is beginning to poke through already, about four months early. 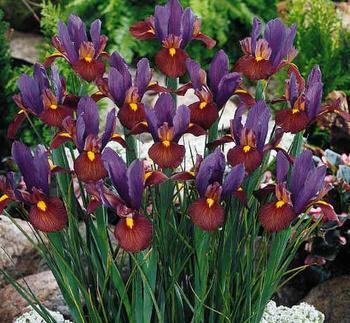 Iris "Eye of the Tiger"
If they manage to synchronise blooming, it should look fantastic. If not then, I get two shows for the price of, er, two. The only other thing bothering me is the clematis tower which, while bottom-heavy when watered, is about eight feet tall and a strong wind could send it toppling. Well, it's not going to kill anyone, just £50-worth of Clematis, so I'll have to trust to luck. Well, that's all for now, I'll update when I get back from the imposing Victorian edifice that is the Royal London Hospital. Some time next week then.